All of us sometimes have to wake up early in the morning. Going to school or work, walking your dog… there are way too many reasons. Yet, it is usually very hard to get up at 4 a.m. and go somewhere out of your bed. Therefore, let us discuss how you can ease such a ‘dreadful’ experience and what are the benefits of walking up early. Even though it is hard to wake up in the morning if you are not used to it, this thing has many benefits, not only for health. In fact, the most significant ones should be listed, which we have done here. Check them out; perhaps you will reconsider the ‘dreadfulness’ of waking up in the earliest morning. Waking up at 5 a.m. or even earlier is natural for human. This time is when the sun rises and a new day begins. Therefore, your biorhythm has long been set according to this time. It means that waking up early is beneficial for health, as your whole body works in these biorhythms. After waking up at 4-5 a.m. each morning for a few weeks you will start feeling a lot better in general and many processes in the body will normalize. If you have no time for a hobby, perhaps you are not considering the whole day. Waking up 3-4 hours before going to work, you have a lot of free time. Moreover, your brain works nicely in the morning. So, if you have always wanted to learn painting or playing guitar, but had no time in evenings, use mornings. You will be surprised how pleasant waking up will become. Apple CEO Tim Cook, Michelle Obama, Xerox CEO Ursula Burns, the founder and chairman of Virgin Group Richard Branson and many more… all these people wake up at 3-5 a.m. They like what they are doing, so they get to work straight after a morning breakfast. Even though there is no big statistics, waking up early in the morning seems to be really beneficial for career and successfulness. Scientists claim that people who wake up before 6 a.m. are much more cheerful and happy than those who get up at 7 a.m. or later. It is, perhaps, due to those biorhythms we have mentioned. When you wake up as it is meant to, your brain knows that everything is fine and there is no crisis. So, a charge of positive energy is assured. If you have ever waken up at 5 a.m., you probably know how peaceful and silent the outside is at this time. Even birds are starting waking up a bit later. Therefore, you get up to feel a real calmness. It is very good for your nerves, as no irritant sounds disturb. You can think about anything you want, do anything you want, and nothing will interrupt you. When you have 3-4 hours before going to work/school, you can cook any breakfast you want. It is especially good for those who usually eat sandwiches in the morning, but want to change this habit. Therefore, waking up in the earliest morning is beneficial for your diet as well. There is usually not enough time to do some exercises in the morning if you wake up an hour before going to work. That is why you should try to set your alarm on 5 a.m. or even 4 a.m. Morning exercises are useful for your health. In addition, they help your body wake up, so your brain starts operating nicely. In fact, such exercises are much better than a cup of coffee. If you do not want to do any exercises, consider simple walks. They are very useful as well, but do not take that much energy. When you wake up early, you can go walk for 30 minutes. This way you stretch your muscles and refresh your thoughts, as it is always cool outside at 5 a.m. If you wake up a few hours before going to work, you are full of energy when you arrive at the office. You can start doing something useful right away, while everyone else is still ‘waking up’. Perhaps, it will help you get a promotion. Even if you work at home, waking up earlier than 6 a.m. will help you do it faster and easier. 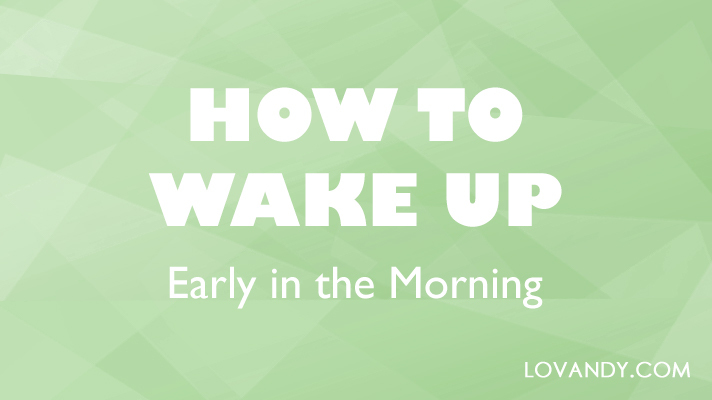 Tell your relatives about all the benefits of waking up in the earliest morning. If they agree to switch to this regime, you will be able to spend some free time together. It is very important nowadays, as when you see your nearest and dearest in the evening, it is hard to relax and talk, because everyone is too tired. So, we have made sure that waking up at 5 a.m. or earlier is very beneficial. However, for most people it will still be hard. That is why we have gathered 10 tips that can help you wake up easier and get used to a new daily regime. Obviously, if you start waking up earlier, you should go to bed earlier too, so that to have enough sleep time. We will discuss later how to make yourself fall asleep at an unusual time. Yet, you ought to understand that it is the most significant factor that affects your ability to get up early. Your brain wakes up easier at the end of a sleep cycle that takes approximately 1.5 hours. However, you still need to sleep 6-8 hours a night. That is why you should wake up 6, 7.5 or 9 hours after going to bed. Luckily, there are many apps that help you control your sleep cycle and wake you up at the right time. However, you will need a fitness tracker, which will precisely know when each sleep cycle starts and ends and wake you up in time. If you find it hard waking up at 5 a.m., you should rearrange your daily regime. Make sure you have to do something in the morning. For example, take a shower, make a breakfast, do some work. This way you will know the sooner you get out of bed, the faster you will finish routine things and have a free time. Motivation is the best thing that keeps you peppy. When you know there are some pleasant and important things waiting for you, will you be able to lie in bed doing nothing? So, start your day and end it, thinking about motivating things; telling yourself how good life is and how much you can do to make it even better. Leave a window open for a night. This way your bedroom will fill with a cool and fresh air in the morning when you wake up. Therefore, it will be much easier to get out of bed. If it is winter, you can open a window for a couple of minutes as soon as you wake up, so that to refresh your thoughts and help your brain cheer up. A healthy breakfast can help you wake up in the morning. Your brain and muscles need many vitamins to start working properly. Thus, if you eat an apple right after waking up, you will have a lot of energy. In fact, this fruit helps you refresh even better than a cup of coffee. It is also a good idea to eat some oatmeal for breakfast, as it helps your digestive system start working nicely, which is important for metabolism. You can use special essential oils that have a refreshing aroma to wake up easier. Scents of peppermint, tea tree or any citrus fruit will do. Just apply a couple of drops on your neck in the morning, and you will wake up faster. It is also a good idea to use some oil diffuser. Straight after opening your eyes, go take a cold shower. It will make your blood circulate faster and your muscles will refresh. This way your whole body will be ready to act. In addition, it is hard to fall asleep after a cold shower, as it awakens your brain completely. We have mentioned that waking up at 5 a.m. is good for doing some exercises. In addition, any physical activity helps you wake up nicely. You may stretch your muscles first and then go to shower immediately. This way you will enhance the waking effect of both things. The sun rises at 5 a.m. approximately. So, make sure its light is on your bed – open the curtains. This way you will wake up naturally. You can use a light-up alarm clock as well. It is useful for a wintertime, when the sun rises a bit later. If you want to wake up really early, you should make sure you go to bed early as well. Remember that you need 6-8 hours of sleep each night, so try to fall asleep using the following tips. You should learn to calm yourself. Go talk with relatives, play with your pet – enjoy the little things. Before closing your eyes, think about how good your life is. While a cold shower wakes you up nicely, a warm bath, on the contrary, helps your body relax and your thoughts calm. You can add a drop of some calming essential oil to water, so that to relax completely. However, make sure you go to bed straight after taking a bath, as you will not be able to do anything hard after it. If you have eaten too much fatty food, your sleep will be disturbed. That is why you should not eat 2-3 hours before going to bed. Moreover, make your dinner healthy. Cook some vegetable or fruit salad or boil some chicken breasts. These foods are easy to digest and beneficial for health. Black or green teas are, in fact, rather invigorating. That is why you should drink only herbal tea before going to sleep. A small cup of chamomile or Melissa decoction is very calming. It helps your brain relax and calms down nicely. If you do not get tired in the evening, do some easy exercises. Just 15 push-ups will do. Take a warm bath after exercising, and you will want to sleep for sure. In addition, evening exercises are as beneficial for health as morning ones are. If you want to go to bed earlier, make sure nothing disturbs you. Make your bedroom dark and silent, so that nothing would wake you up. Ask your relatives to switch to a new regime too, so that there were no misunderstanding. It is a lot easier to fall asleep, when you know there is nothing that needs to be done ASAP. Therefore, try to make sure you have no work 2-3 hours before sleep. Remember that you can work in the morning, as you will wake up at 5 a.m. Walking in the morning helps you wake up, while evening walks refresh your thoughts and help your brain relax before a night sleep. You need only 15 minutes in the open air to feel peaceful and reasonably tired. Considering this, it is a good idea to have a dog, as you will need to walk him each day before bed. We are talking about fiction here, no tutorials or textbooks. Moreover, the book you read in the evening should have a happy ending and a funny plot. Do not read any dramas, as they will disturb your mind at night. Reading a book can help you feel tired and you will not even notice how you have fallen asleep. Perhaps this thing is a thousand years old, but it works. You do not have to count sheep specifically though. Just do something boring or tedious. For example, assemble a puzzle. Even if you are not very tired, you will want to go to sleep after 20 minutes of doing this. There is also another technique that should help: when lying in bed, try not to sleep. Think about staying awake. Surprisingly, you will want to sleep more. Waking up at 5 a.m. or even earlier is truly beneficial for health. You should try it at least ones. However, it takes some time to get used to such regime. Therefore, use our small tips and go to bed in time. Make sure your daily regime is full of useful work, so that to get tired reasonably.